Agia Lavra. The monastery of Agia Lavra in Achaia, Peloponnese, is located 5 kilometres from Kalavrita. It is built at a point from which one can see the whole Vouraikos river valley. Agia Lavra was built in 961 at an altitude of 961 meters, it once housed also 961 monks. The monastery church has a finely icon screen, frescos which are unfortunately damaged by fire and the icon of Agia Lavra. Here is also a huge library of 10.000 volumes from the 12th and 12th centuries. The monastery was burned down several times, but has always been rebuilt and the church from 1600 remained intact. On the hill opposite stands a monument to the heroes of the revolution of 1821. On March 25, 1821 was proclaimed the independence of Greece here by Bishop Germanos of Patras. 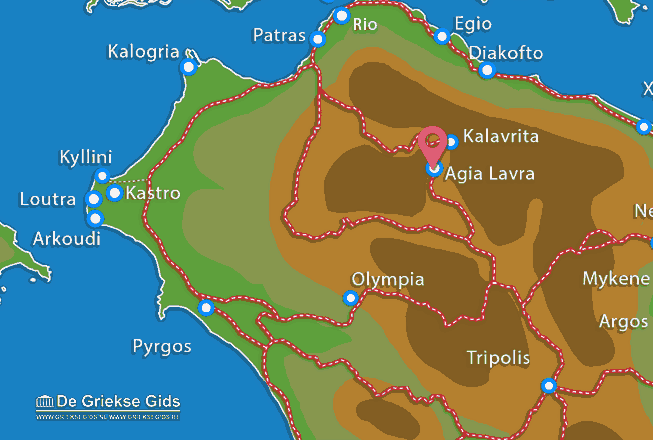 Achaia: Where on the map is Agia Lavra located?